And so it was that UPN came down from the heavens and demanded that Enterprise be more serialized and more exciting and more explosioney. Thus then did the staff go forth and fill Season Three with all the hand-wringing, shouting, and darker plot threads that seemed to work so well for DS9. After experiencing their first run-in with the dangerous anomalies of the Delphic Expanse, some serious jerks board Enterprise and Archer goes all Adama on the one jerk they managed to capture. This leads the crew to a ginormous, mysterious sphere. Archer tracks a component of the Xindi weapon to the Arborial Xindi colony that's producing it only to find that things aren't as he expected. Additionally, this episode has some interesting Xindi history, a new lemur friend for Archer, and we get to learn all about the lost Avian Xindi sub-species. 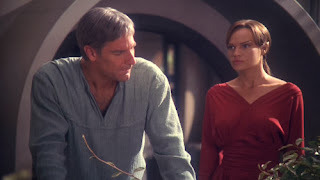 While T'Pol and Tucker try to dismantle one of the spheres, Archer makes a plea with the Aquatics to help him go after the stolen Xindi weapon. You get some really cool Aquatic alien stuff as well. Their ships are basically flying fish tanks. The season finale. Nuff said. Honestly, these aren't really runners up. They're my favorite episodes of the season but you don't HAVE to watch them to get the story. They're just good episodes. This is the "one time this amazing, tragic thing happened in another timeline" episode of Enterprise. Archer's brain gets infected by some anomaly parasites. That means he can't remember anything past a few hours and he and T'pol end up chilling together for thirty years while humanity is destroyed. It gets me right in the feels. Every time. Aaron Pierce (Glenn Morshower) showing up as a cantankerous, tough Old West sheriff. Everyone getting dressed up like they belong there.